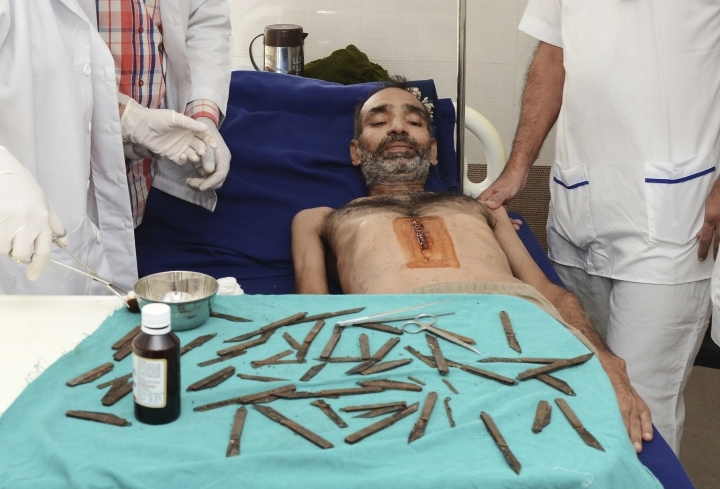 NEW DELHI — Doctors in northern India have surgically removed 40 knives from the stomach of a man who had swallowed them over the past two months, one of the physicians said Tuesday. 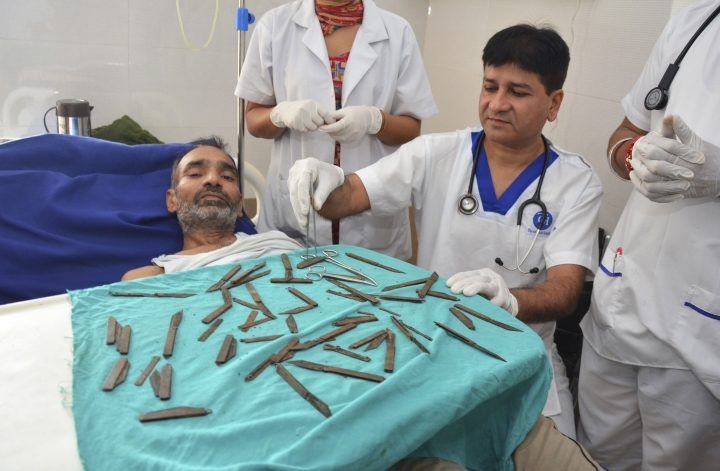 "In my 20-year career, and in all the medical literature that we checked, there has never been a case like this one, where a person has swallowed not one, but 40 knives," said Malhotra, a critical care doctor at the Corporate Hospital in the city of Amritsar. The man told doctors that he could not explain his urge to swallow knives. "He told us he would swallow the knives along with a glass of water," Malhotra said. "He had no explanation for why he did it. Just an urge." "In an endoscopy, we saw a big mass in his abdominal area," Malhotra said by phone. "We initially thought it was a tumor or some cancerous growth. But it was like nothing we doctors had seen before." There was massive internal bleeding during the surgery because the knives, which were all made of iron, had lacerated the man's stomach walls, Malhotra said. Since the surgery, the man has told doctors that he can't bear to look at another knife. "He even asked his wife to get out of the room when she was cutting some fruit for him," Malhotra said.